For more information on natural-ice skating in general, I've written up everything I know here Ice skating on natural ice in Sweden. We were on our way home after a perfect afternoon trip from Uppsala to Wik, and had just passed the fault that usually forms outside the turn-off to Hammarskog (and which happens to be the location where the pictures below were taken), when we watched an old man skate straight into the open water, which apparently he didn't even see. My first reaction was that this was just another little mistake that would be over in seconds as the guy turns around and pulls himself out with his ice prods. But instead he tried to get up on the opposite side, where the ice was weaker and kept breaking away, and he ended up with his arms under the ice where he couldn't do very much anyway, and it quickly became clear that he probably wasn't going to be able to get out by himself. It was lucky we were passing as there were no other skaters in sight. I called to him to turn around and swim back to our side, and then saw that he had no ice prods (it turns out they were in his pocket, but with big mittens on, it was unlikely that he would have been able to get them out), and I threw him a rescue line. 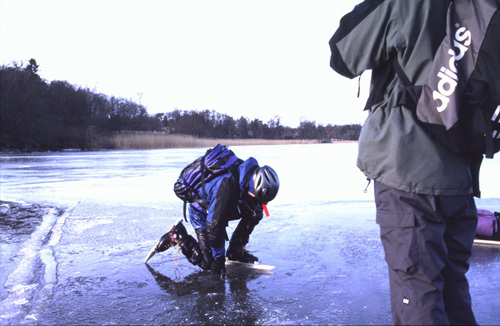 I'd practiced this many times before, but always with the idea of rescuing someone far away over thin ice, so it was a surprise when I threw him the packet from 4 meters away and I had to then pull back 20m of extra line before getting any tension. There's no way around this, since it's very hard for the victim to hold the middle of the line, but it was frustrating to waste even 10 or 20 seconds while the guy was bobbing about in the freezing water. It then took two of us to pull him up, since he used both hands to hold the end of the line. He was wearing a life jacket, which helped him float high enough that we even had a chance to do that. He later told us that he was 87 years old, lived close by, and was looking for his wife, whom he thought he had seen further out, but who turned out to be a navigation bouy. He didn't seem particularly bothered by the swim, and was as alert as anyone his age, but still I was worried about his heart, and tried to pursude him to let us follow him home or at least take some dry clothes, but he insisted he was fine, and would head straight back. Eventually we had to leave him, because arguing with him was just delaying him getting home, and he seemed to be thinking clearly, just stubborn. These pictures were taken while I was practicing self-rescue techiniques. Unfortunately the photographer missed the important steps of getting up on to the ice, which in this case I managed without using ice prods, thanks to the bouyancy in my backpack. 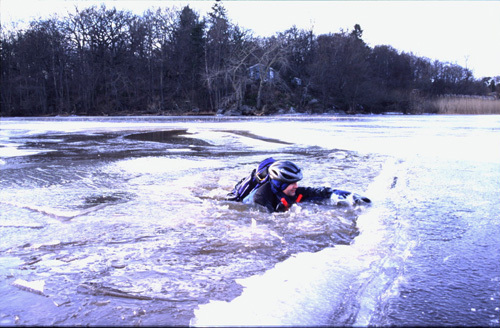 After several thousand kilometres skating on natural ice over a period of 25 years, I finally went through the ice by accident yesterday, and what annoys me is that it was caused by sloppiness and nonchalance - not a misjudgement, but a lack of any real judgement at all. An experienced friend and I decided to skate from Wik towards Biskops Arnö on lake Mälaren, south of Uppsala, a few days after I had done the same trip with no problems. The temperature was just below freezing, and the wind gentle, so great conditions, and since my friend had his pike with him, I left mine in the car, thinking I could enjoy an effortless, relaxed day's skating, with arms free to take pictures. At the car park we met an inexperienced solo skater who completed our group. Air temperatures had been rising, so a lot of tensions had built up in the ice, and the small disturbance caused by our travel triggered some of these to release through the sudden development of cracks (similar to the triggering of avalanches), which make scary but harmless noises. These were entertaining us, especially when they started increasing in frequency, which should have been a red flag, but was ignored, and we continued to skate very close together, chatting happily. 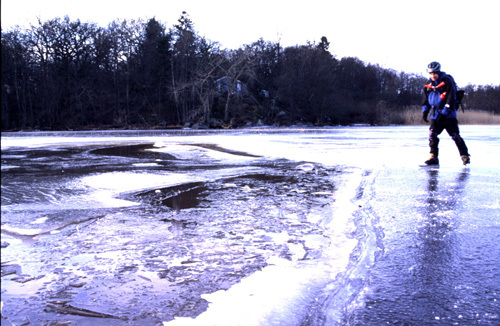 Then the ice under my friend started to tilt and go under the water, at which point we turned and headed towards land, where we thought stronger ice would be. But still we were unfazed, despite the fact that I now estimate that we were less than a second from all sliding down the ramp into the water, and could have had trouble getting out again if the last slab tilted as we tried to get on to it, and no-one was left on solid ice to use a rope. Close to land I was rather sure I'd seen another group pass, yet there was a patch of water to cross, which we soon realised was just a layer of water over the ice, so I happily skated through it, now confident that the other group had passed here (later I realised that they most likely walked on land). So I continued, soon to fall flat on my face in shallow water, with a very sore thigh. 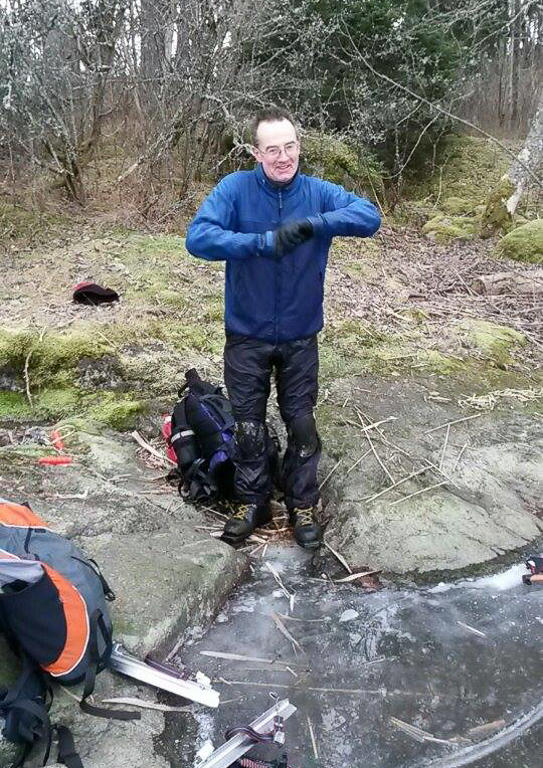 Because I didn't get very wet, I thought it was also water over ice, but now in retrospect realise that I actually went through a small hole, and my thigh rammed into the edge of the ice and tipped me on to strong ice beyond. 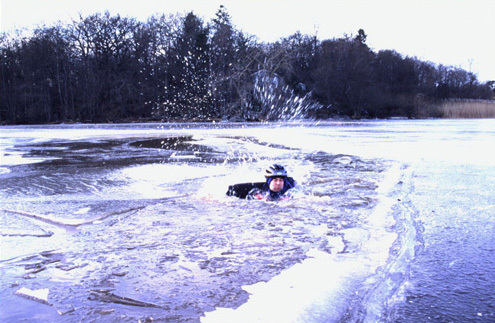 This should really have woken me up and got me thinking, but 25 years of not really falling in had made me blasé, and after my friend threw me his pike, I tested the ice in front a bit, decided it was fine, skated a few meters forward, and sank down into deep water. This is when it's great to have practiced, as it just felt routine to turn around to face the known good ice, and try to climb out. I was calm enough to experiment with not using my ice prods, which had worked in training, but not this time, so I used them and came up easily. Surpringly, dropping into water whilst skating doesn't feel like a cold shock in the way that diving into much warmer water in the summer can. I guess it's the clothing, and the fact that your body is already working to keep you warm, but it felt more wet than cold as I went down. Due to the mild weather, even getting changed wasn't very dramatic, with only my hands feeling really cold afterwards. If it had been -10 and windy, that bit would have been a much more painful project. Even at -2, some of my wet clothing had frozen to the rocks by the time I tried to put them back in my pack, which was now many kilos heavier because of the wet clothing. We carried on with the trip, and after a few hundred meters I felt warmer than I had on the previous trip in bad weather. So this was an undramatic event with only hurt pride, as 99% of ice incidents are, when you have the right equipment. But there was still more luck involved than there should have been. 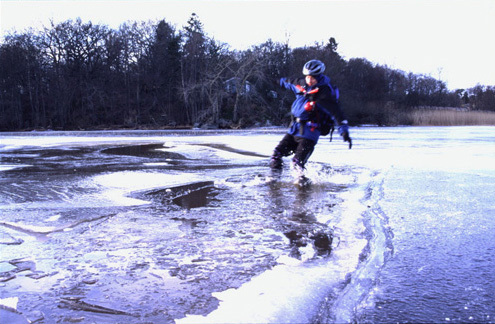 If the ice I went through hadn't been so clean, I might have had to battle through ice too thick to swim through, but too thin to support my weight, or there could have been slabs that tipped as a climbed on to them. Or I could have hit my head or broken an arm on the ice and not been able to climb out. Lessons learned ? Pay attention and don't get sloppy ! Having ice prods goes without saying, but at least as important is floatation that keeps your head above water, and makes it much easier to drag yourself out. Imagine trying to get out whilst having to swim with your arms to stay above water, like getting up on to a floating jetty in the summer, except it's covered in vaseline. Company with a rope is the next line of defence, which we didn't need here, but easily could have. And a small point - don't leave your wet clothes on the ground too long. It's also good to be in the company of a diving instructor and a soldier, who won't make a drama out of a crisis. Thanks guys for the calm support !